This is the best book that I have read in 2014 so far. I am completely in love with this book and was so sad to see it end. Not to mention how head-over-heels in love I am with Jace. Every girl can't help but love the star or anytime but when it comes to someone as amazing as Jace; you can't help but want to pull him out of the book. I never expected this book to take some of the turns that it did but the constant surprise of evens made me feel every emotion along with Eden and Jace. I loved that it didn't put Jesus in a box and make it seem like once you get saved everything is perfect and you never struggle again. Absolutely great job Susan! Now lets get into the juicy details of this book. Eden was the person who took care of everyone (I can relate to that). She took over the role of being her brother Owen's cheerleader and generally anything he needed. Owen gets onto the team of his dreams and plays with his role-model Jace Jacobsen. Eden does everything in her power to keep Owen straight and away from Jace but he ends up just pushing Eden out of his life. Eden becomes lost with confused with her own life and can't seem to stay away Jace who is there everywhere she turns. Jace struggles with his reputation and career as his injury's becomes worse. Eden seems to get under his skin and he wants to stay far away from her because she is a reporter. The last thing he needs is his injury and lack of future to get published but in trying to push her away he ends up bringing her closer. As the two of them join together to help someone they stumbled upon, they find exactly what they needed in their lives and what they truly want. 1. This is the second installment in a new six-book series. Can you give us a bit of background on this series? 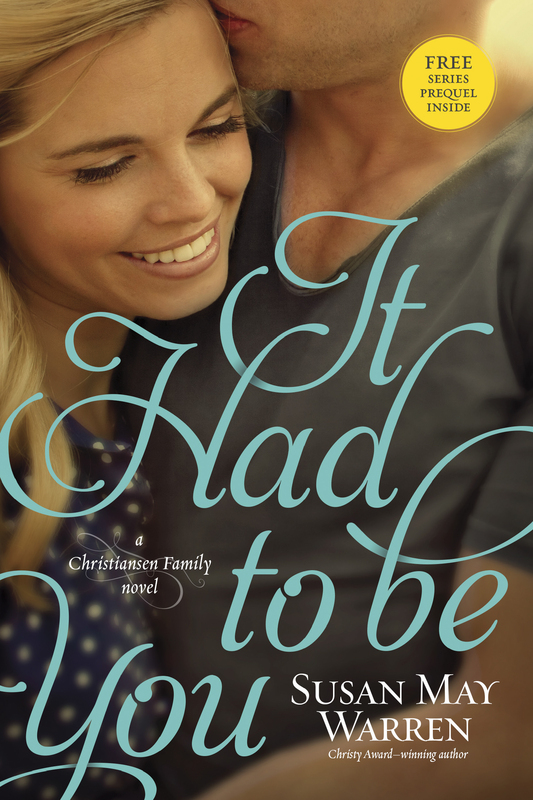 The Christiansen Family series is a spin-off of the bestselling Deep Haven collection, stories about the townspeople of Deep Haven, Minnesota, a tiny resort town on the north shore of Lake Superior. The original series started with a book titled Happily Ever After and grew to include six titles. However, one family began to stand out, and we decided their story needed to be told. We wanted a series about a family with adult children learning what it meant to carry on the legacy of faith into their lives. And I wanted to write a series that would really let readers dig into the family, feel like they were a part of their journey. It’s a gorgeous place to set a story—on the rocky shores of Lake Superior, in a tiny town where everyone knows your name. It’s a town with a rich heritage, strong ties, and a place where people want to escape—in fiction and in real life (as it is modeled after my town of Grand Marais, Minnesota). You’ll find people from all walks of life here—and most importantly, Evergreen Resort, run by the Christiansen family for four generations. Of course, I hope people fall as much in love with the Christiansens as I have. They’re a great bunch—all led by John and Ingrid Christiansen, who have tried to instill their values into their children. But each child has their own path to walk, and part of the series is just watching as they walk that path—through the good and the bad, trying to figure out where their faith and their parents’ legacy fit into their lives. It’s a contemporary epic family series set in the wilds of northern Minnesota with romance, suspense, and lots of great family drama! 4. What was your inspiration for this particular book and the main character Eden Christiansen? Eden Christiansen came from a number of places. Watching the siblings of movie stars and athletes, watching my own daughter cheer her athlete brothers, even watching my friends, parents who feel on the sidelines of their children’s lives . . . maybe even a little left behind as they leave for college. I began to wonder—what if you had an amazing sibling, and your entire family focused on his or her successes, and you felt left behind, void of your own amazingness? This is Eden—who feels like she hasn’t accomplished anything and is sitting on the sidelines of her life. She feels like she needs to “get into the game” but doesn’t know how or where to start. And she feels like she really has nothing spectacular to offer . . .
Jace was loosely modeled after famed Minnesota Wild enforcer Derek Boogaard, who died, in part, due to the many concussions he suffered as a hockey player. The problem of concussions with today’s athletes, especially in hockey and football, can be life-threatening for athletes, and although hockey (and football!) is played much differently today, it’s still an issue. Of course, adding the John Doe element only rounded that theme out with yet another perspective. I loved how these three angles came together. I think we all need to see our worth not in relationship to our external successes but in how we work out the task God has for us. How we love one another, how we use our gifts and talents. How we abide with God in our daily lives. Hopefully readers will begin seeing their worth in a new way. 7. How do you expect this new series to resonate with your audience? How do you want your books to make them feel? I am hoping readers walk away from this book, and this series, with hope. The sense that they belong to something—to God, to family—and the feeling that our lives are not chaotic or out of control, but that God has a unique and amazing journey for each of us, and it’s lived out within our relationships. I want them to feel as if they’d found a new set of friends. 8. Have you received any feedback from your fans on this series? What are they saying? People fell immediately in love with Darek and his sweet son, Tiger, in Take a Chance on Me, and I think readers will really enjoy Jace and Eden’s romance in this story. I’m thankful that people enjoy the work I put into developing my characters and the romance, and I have loved diving into these multilayered stories about people with realistic, everyday struggles. I loved writing about Minnesota in the winter. And I loved the story of John Doe and uncovering who he might be. (I plotted it like a mystery, so it was fun to revisit my mystery-plotting techniques). I especially loved the layers of Jace, the hero, and how, with every turn, he became more intriguing. Try to up your writing game with each book, and just keep writing. Not every story appeals to every reader, but I try to write a story I would enjoy—and then hopefully my readers will also. I think I’ve stayed true to who I am and the kind of story I’m supposed to be writing. I’m very blessed by my reader friends and their constant encouragement. I am very blessed to spend my days with the Christiansen family!